I have made do with the old look for over a year. But it is an absolutely, positively, straight out-of-the-box Blogger template. Kind of embarrassing if you happen to know what I do for a living. A brilliant graphic designer friend of mine kindly volunteered to help me spiff up the blog by creating a new masthead. Frankly, I think she was embarrassed for me. I took that opportunity to run my first contest to pick the winning masthead design. Here was the overwhelming favorite. The detailed comments provided by readers enabled us to adjust the colors and the fonts to come up with the final look/feel. Thanks Missy Brilliant Graphic Designer. Then I went to work on the layout and more. I have been mulling over switching from Blogger to Wordpress because Blogger (the Google supported platform) is just not considered hip by the cool people. At the BlogWorld #NMX conference I went to earlier this month, at a session on Advanced Blog Design, the presenter +Mitch Canter , took a poll of blog platforms being used out in the blog-o-sphere. In a room of about 150 or so, most were WordPress and only three of us were Blogger. But switching platforms is a lot of time and money that I don't have. So with a little online research, I was able to make critical changes to the blog such as the horizontal bar menu and other little format tweaks including font changes (buh-bye Ariel), and widening the columns for big pretty pictures. +Mitch Canter also shamed me on Ariel font. 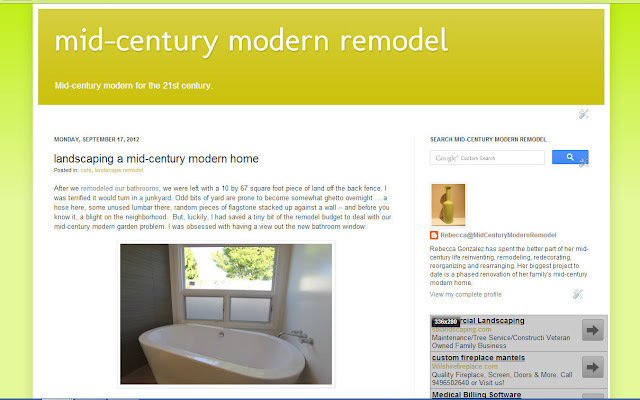 And I have been meaning to add several pages and a menu for a very long time: About, Terms & Conditions, Remodeling Projects, Blog Mentions, as well as Contact. And I got it all done this weekend. Yay! In the About section, I finally posted a link to a video that was recorded of me by Australian blogger, +John Young of Young Digital Group, last October. Take a look, it's the real me in my real living room. And last but not least, I linked the blog to Google+. At the #NMX conference, +Amanda Blain lectured on the benefits of embracing Google+. She spoke in plain English. "Google+ is important to Google, dummy." So I took the plunge. One of the neat little features I have already noticed is that you can type "+" in your blog post and you get a selection of all the people in your Google+ circles to link to. Kind of handy. TheNapaProject - Noticed this was a Blogger blog and had navigation links. Bingo! If you see formatting you like, and you are on Blogger as well, I am HAPPY to help (if I can). And if you have further suggestions, please do tell. I can take it! Rebecca, the new masthead looks amazing, and I hung on every word of the interview with you. There are so many things you learned at the conference that I don't have a clue about! I'm so excited about all this. Also, thanks for the mention in this post. Dana, I meant to email you in advance about utilizing your blog. It was quite a long weekend though and it escaped me. I knew you are very kind and would not mind. I know you are on Blogger too so I can help. Thanks for the kind words and all the support this last year. I kinda liked the red and eggplant in the original masthead, along with the taupe background. But the revised one is nice too--it just seems more sedate. But I'm the one who chose a wild animal theme for our powder room, so I'm not sure you should take my opinion seriously. Fair comment. The red/green does evoke a little of Christmas. We dropped the taupe so that there wouldn't be a "box" around the header. I do take your opinion seriously, swear! You are right, the final version is a little bit more pulled back. I LOVE the new look. So sharp! Congratulations, Rebecca! Julia, thank you so much. I really appreciate the inspiration provided by your blog. When you changed to the clean/professional style it really caught my eye. Rebecca, I love it! I love the shapes and the colors. We just had a cat condo designed with the same shapes, which I have to do a blog post about. Your blog is so organized, great job! Thank you so much Michelle!!! And I owe you a special thanks because you were the blog where I noticed the menu at top, and then realized I could do that too in Blogger! Yay us! And oh, did you say cat condo? Yes you must post. ooo la la... very modern cool! Love the new design. It just screams mid-century with the great shapes and colors. I know you're really proud! So nice to have friends who can create such amazing designs and are willing to share their talents. LUCKY YOU! Doesn't is SCREAM mid-century? I thought I would hit people over the head with it. Yes, I am lucky to have a brilliant designer friend. And, I so appreciate your offer on WordPress. I think I'll have to go there at some point. Maybe that will be a 2014 activity. So you will get that call! Be careful what you offer!!! Love the masthead....Happy for you! I'm inspired, as always after seeing your posts! Thanks for sharing the video. So cool. Hi Brooke, thanks so much. I am just so pleased. It was fun to buckle down and get something done finally this weekend. My designer friend is happy too. She didn't know exactly what I was planning to change around her beautiful masthead. Yippee!!! Looks gorgeous!!! Love it! I'm waiting on some blog updates as well...it's fun to start the new year with a new look and more organization! Melissa, it is fun to start the new year with a new look and a little organization to the bloggy clutter. Now I need to get around to planning a new kitchen. It has taken me a long time to figure out you are a true color person. Use it to your advantage because most of us are just simply blind. Mr. Truesdale!! How does your garden grow? It is nice to see you here. Hi Rebecca! Your blog looks great and really sharp. It's really well laid out, and easy to navigate. The new header really gives it some pop of colour too. Great job. Rebecca. I loved your BLOG before and now it is even better. I just started one myself but with no skills I adopted a default look/feel. I can learn so much from you and will continue to watch. You can catch me at obscureaussie.wordpress.com. Yay Mike! I will go right away. If you ever want to skype I am sure we can find a time. Do you start work right when I end or something like that? I will go check it out!